After a red-hot start to the season, the Drexel University men’s wrestling team continued their quest for dominance with their participation in the Shorty Hitchcock Classic at Millersville University Jan. 17, and two Eastern Intercollegiate Wrestling Association matches, facing the United States Military Academy and Columbia University Jan. 20. Drexel was victorious in all three bouts, with the Dragons winning against Army and Columbia and freshman Julian Flores placing second at the Shorty Hitchcock Classic. In the Shorty Hitchcock Classic at Millersville, Flores started off red hot with a 18-2 technical fall win over Anthony Patsy of the University of Pennsylvania and a 3-2 decision over Corey Shie of the U.S. Military Academy. He continued his dominance with a 3-1 decision over University of Maryland’s Michael Doetsch. However, Flores ran into Lehigh University’s Joe Loback, who won over Flores 4-0, placing Flores in second. In addition to Flores, Evan Barczak also competed well. He started off a little rough with a first-round loss, but he bounced back to win the next five matches. Against Army, Drexel did exceptionally well, winning 20-12. No. 4 freshman Austin DeSanto started off the win streak with a major decision over Lane Peters in the 133-pound weight class. Following this were major decision wins by freshman Trevor Elfvin and Garett Hammond in the 149 and 157-pound classes. To add to the victories, freshman Ebed Jarrell won 7-6 over Cael McCormick in the 165- pound weight class. 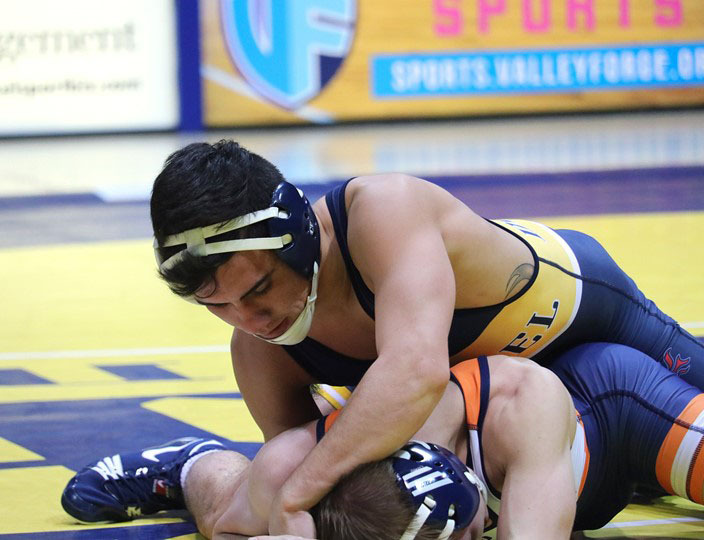 Drexel finished off the match with two more wins, in the 184 and 197-pound weight classes. In 184, senior Alex DeCiantis had a 3-2 decision over Noah Stewart, and at 197, junior Stephen Loiseau beat Rocco Caywood 4-3. Drexel moved onto their match against Columbia in New York, where they won 27-9. Drexel got off to a great start, with victories at the 125, 133, 141 and 149-pound weight classes before dropping at 157. Senior Zach Fuentes had a 14-6 major decision over Spencer Good, while DeSanto had another win with a technical fall win over Alec Kelly. Flores got his second win with a 10-1 major decision over Val Miek, and Elfvin squeezed by with a 7-6 win over Jacob Macalolooy. Jarrell also got into the mix with the 12-1 major decision over Lawrence Kosoy, and DeCiantis earned a 10-3 decision over Andrew Psomas at the 184-pound weight class. Finally, Loiseau beat Michael Bulkin 16-6 at 197-pounds to close out the night. Drexel will head back home to compete against another rival in the Eastern Intercollegiate Wrestling Association, Binghamton University, as a part of the Homecoming weekend festivities.